Çin ve Hindistan sonra dünyanın en kalabalık 3. ülkesi olan Amerika Birleşik Devletlerinin İngilizce Tanıtımı adlı yazımızda İngilizce ve Türkçe olarak bu ülkeyi daha yakından tanıyacağız. The name “America” comes from the Italian explorer Amerigo Vespucci. The term the “United States” was officially used in the Declaration of Independence in 1776 and then again in the Articles of Confederation in 1777. “Amerika” ismi İtalyan gezgini Amerigo Vespucci’den geliyor. “Amerika Birleşik Devletleri” terimi 1776’da Bağımsızlık Bildirgesi’nde ve daha sonra 1777’de Konfederasyon Makalelerinde resmen kullanılmıştır. Description of Flag: The current flag of the United States was adopted on July 4, 1960. The original 13-star version was adopted on June 14, 1777. The flag has 13 horizontal red and white stripes. There are seven red stripes and six white. In the upper left corner there is a blue square (field) with 50 five-pointed white stars. The thirteen stripes represent the thirteen original British colonies that formed the country. The 50 stars represent the current 50 states. 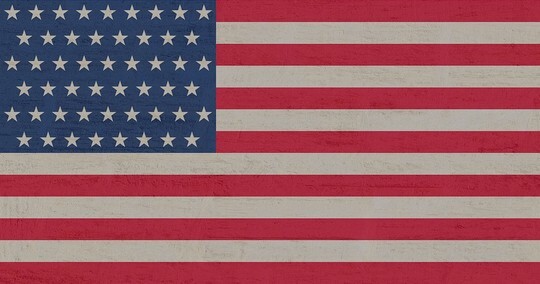 Bayrak Tanımı : The current flag of the United States was adopted on July 4, 1960. The original 13-star version was adopted on June 14, 1777. The flag has 13 horizontal red and white stripes. There are seven red stripes and six white. In the upper left corner there is a blue square (field) with 50 five-pointed white stars. The thirteen stripes represent the thirteen original British colonies that formed the country. The 50 stars represent the current 50 states.